The light curves in a graphical form. The IC-filter magnitudes are plotted as a function of the phase of the derived period (for periodic stars) or heliocentric Julian Day (for non-periodic stars and periodic stars with periods longer than 25 days) (PLOTS). The variable stars are divided into 13 categories defined here. The table below gives the number of stars of a given type in the catalog. Column 5: error of the magnitude (in mag). This error is transformed from that given in column 3 and does not include the errors of transformation. The files which are referred to via PLOTS links in the table above contain tarred and gzipped files with PostScript plots of the IC-filter light curves as well as finding charts. A sample chart for a periodic star is shown below. The light curve is shown in the left-hand panel. The magnitudes are folded with the period shown in the top right corner. The star name is given in top left corner, whereas the cross-identifications are given in the bottom. If the data from two adjacent parts of the field were combined, like in this case, an encircled 'C' letter appears right of the star name. The right-hand top panel shows finding chart of 99 x 99 pixels (43'' x 43'') with the variable star centered and encircled with a light-grey circle. In the right-hand bottom panel, the classification, right ascension, declination, IC-filter magnitude and (V-IC) colour, are given. For stars classified as APER, MIRA, MLE and PER with dominating periods longer than 25 days the light curve is shown as a function of heliocentric Julian Day (see figure). 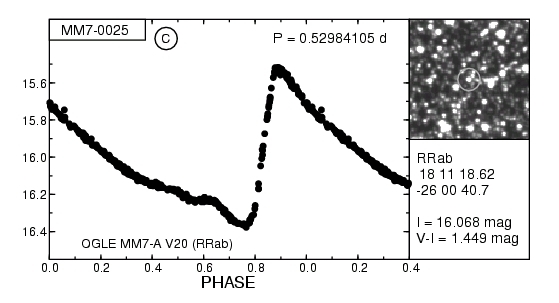 Udalski et al., 1997, Acta Astronomica 47, 1. Syntax of a star name: OGLE <field> V<number>, e.g., OGLE MM7-B V33. Woźniak & Szymański, 1998, Acta Astronomica 48, 269.
and OGLE #<number>, e.g., OGLE #14 for microlensing events. Żebruń, 1998, Acta Astronomica 48, 289. Syntax of a star name: OGLE-LT-V<number>, e.g., OGLE-LT-V101. Szymański, Kubiak & Udalski, 2001, Acta Astronomica 51, 259. Syntax of a star name: SKU <field>.<number>, e.g., SKU MM7A.34501. A.Pigulski, Last updated: October 2, 2006.